I knew I had to go to Eureka Springs while I was in Arkansas. I was simply too intrigued. You see, before I left, an Arkansas native told me in hushed tones, "That's where all the hippies and lesbians are." 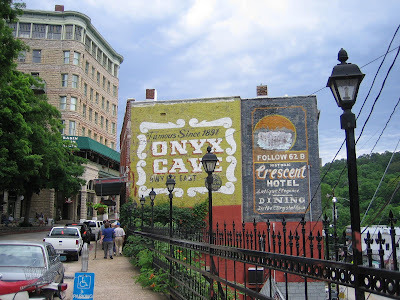 Now that I've actually been to Eureka Springs (population 2,350), located high up in the fabled Ozark Mountains, I'm still having a hard time believing that this place exists. It's just too good to be true. Certainly I've never encountered anything like it in the South. I would like to describe it in a way that doesn't make me seem spellbound. Problem is, I think that's exactly what I am. So bear with me. I'll first try to articulate what this one-of-a-kind, Utopian town is like in words - and then in photos in a separate post. A few facts to back up these grandiose descriptions. Fact one. 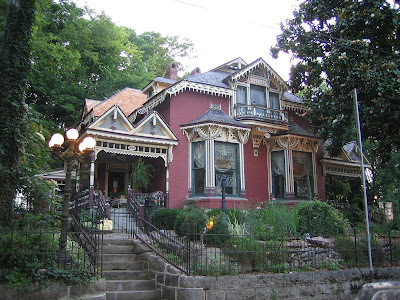 The entire town of Eureka Springs is on the National Register of Historic Places. All of the historic buildings, hotels, homes and cottages have been preserved, and the town looks much the same as it did at the turn of the century. Because the original industry (bottling spring water under the Ozarka label and running "healing" bathhouses) died, growth stopped, and the only industry left was tourism. So to stay alive, reinvention was necessary. Homes were renovated and turned into B&Bs. Now, there are over 70 B&Bs in this walkable (albeit with some steep stretches) mountain village. 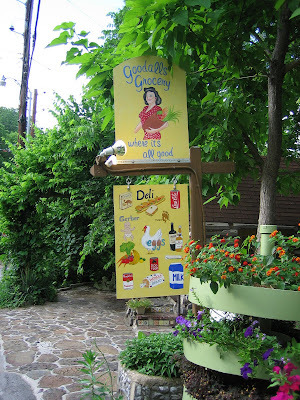 Culturally, the most striking thing about Eureka Springs to me, though, was that it's not just a gay-friendly place. In actuality, it's a place where ALL kinds of different people - from gays to bikers to hippies to evangelicals to outlaws to Yankees - live in harmony. Tellingly, the town motto is "Where Misfits Fit." Tucked away in the lush mountains here, no matter who you are, you are embraced and accepted here as long as you embrace and accept everyone else. As enchanted as I am? Stay tuned for part two - "Eureka in Photos"! It seems too good to be true. What's the weather like? Are there termite problems? Is there Extreme Weather? I am thinking that there must be something lurking there. I'm with you. I'm looking for the catch too! Regarding the weather, the weekend I was there was extremely pleasant: 80s during the day, low 70s at night. But like the rest of the state, July and August average in the 90s. So that could take getting used to coming from LA, where we have very few days in the 90s. But it's not much worse than many other places that have hot summers. Here's a summary of the climate and a chart of the average temperatures by month. According to the Chamber of Commerce, there aren't many days below freezing in winter and snow melts quickly if it does fall. So winter sounds pretty mild. And here's something about how tornadoes are not as common here as the central parts of Arkansas. Unlike everywhere else, I heard no tornado horror stories and saw no hail damage. So maybe termites are the catch. I'll look into that. Because there's gotta be one, right?